My nails from yesterday looked too boring I couldn't stand it anymore! I used my new nail LA Colors art polishes, I love them! wow u must really have a steady hand! i could never do thh! Very pretty. 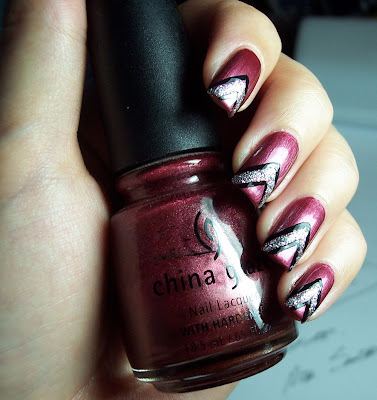 I always admire others art on their nails. When I get the polish on I think it's too pretty to mess with. Mary: Thank you! 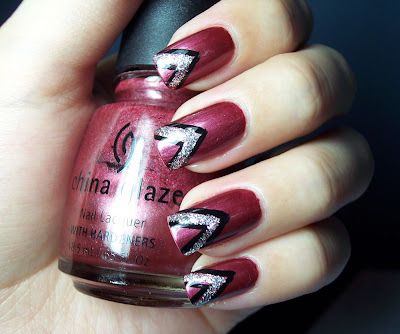 Alex called this 'superhero nails' since looking at it rightside up the design was big V's. I dunno if you like video games but it looked like Viewtiful Joes helmet! cool! I love the "v" design! Very pretty design! Good job! Hi Rachel, I love your all your konads! You do a fantastic job. This color looks fabu on you. Very pretty design. Denny, thank you very much!